There are many different reasons why people often need some sort of temporary window protection. For instance, if one of your car windows was damaged but you didn’t have the time for an immediate fix, then you would need some type of temporary protection. Here are three of the most common types of temporary protection that you could use for your windows. One type of protective covering you could use for your windows is an adhesive film. Some people use this type of short-term film to cover a missing window in their car while they are waiting to get the window replaced. This type of covering can be effective for short-term purposes. However, it is important to note that there are many different types of adhesive films. 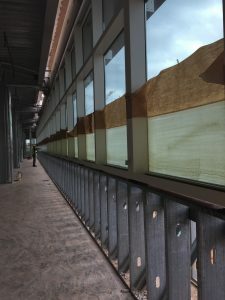 Another type of protective layer that construction workers often use to look after their specialized equipment is block-out film. This type of window protection is significantly thicker than the average window covering. It actually effectively prevents people from being able to see through glass. In fact, some companies use this type of film to keep people from peering in to see new products before they are released to the public. There are even films that prevent people from putting graffiti on windows, which can be tough to remove. This type is commonly referred to as an anti-graffiti film. Some companies choose to implement this type of film in order to avoid costly repairs to their windows. These are just three types of temporary window protection some people choose to implement. Whether you need to cover an opening in your car window or simply want to reduce the prevalence of graffiti on your company’s windows, then you may want to think about using a window film. Make sure you contact a professional before you apply any type of protective window layering. After all, you want to be sure that you get the right window film. Why Does Your New Building Need Construction Protective Coatings? 2018-05-14Armor Guard Protective Coatings Inc.
Armor Guard Protective Coatings Inc.